Partners in the 100 Years 100 Quilts show, l-r Lenna DeMarco, Anne Hodgkins, Anne Woosley, Wanda Seale and Carole Cohen. 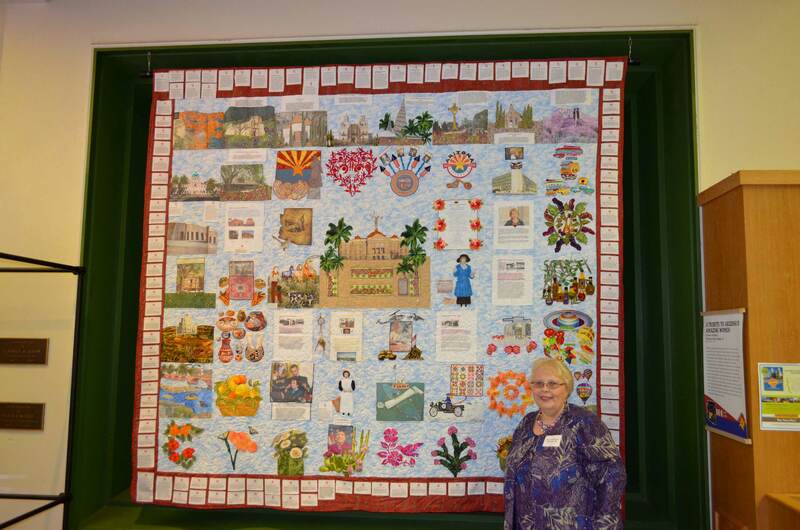 Close to five years in the making, an amazing exhibit of the quilter’s art in the Arizona centennial year went on public display February 18, 2012 at the Arizona History Museum, 949 E. 2nd Street, Tucson, Arizona. 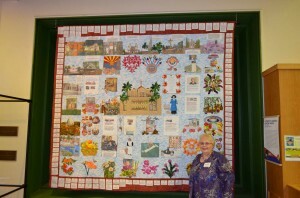 For a solid year, through March, 2013, “100 Years, 100 Quilts” will be on display all over the Tucson branch of the Arizona Historical Society. 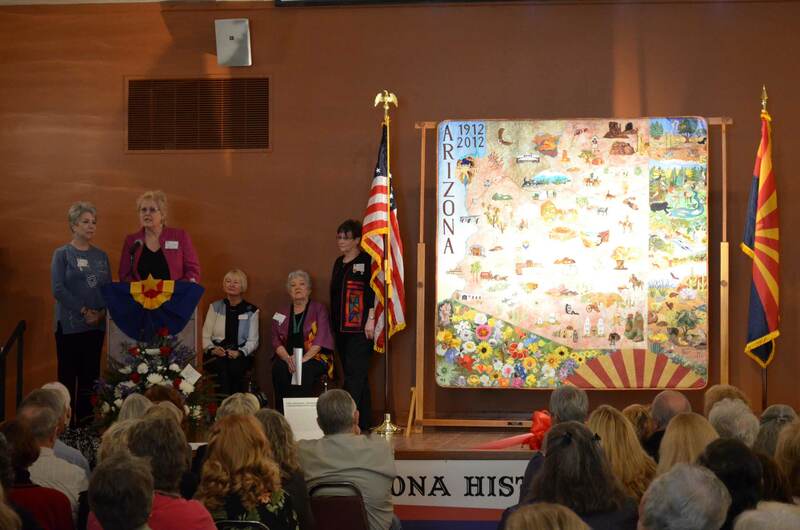 Some 800 people showed up to drink in the exhibit, which showcases Arizona through the yes of members of the state’s vast and talented quilting community. 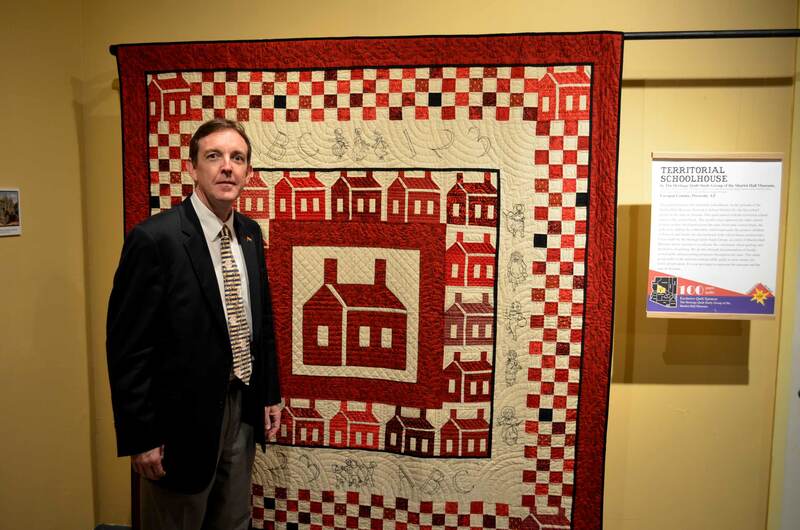 Arizona Secretary of State Ken Bennett cut the ribbon to open the exhibit, and stayed to take in the entire show, posing along the way for photos with quilters whose work hung in the show. 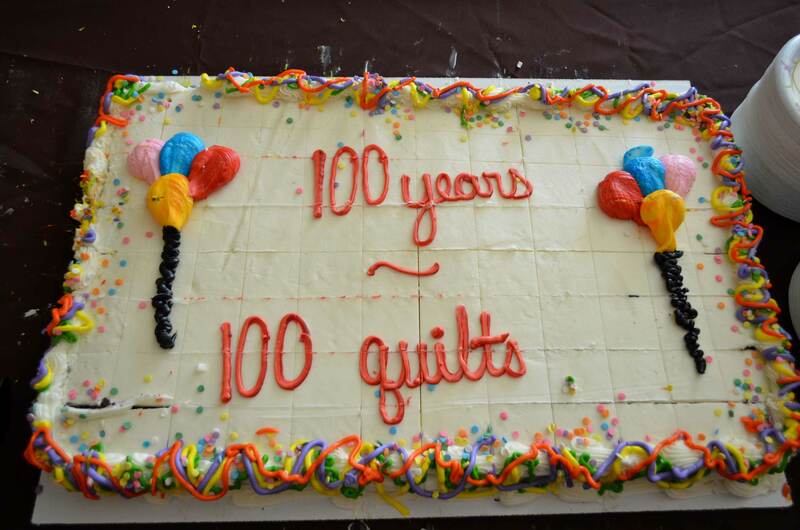 It was also a gathering for family and friends of the quilters, and a time to acknowledge those whose hard work generated this unique collection. 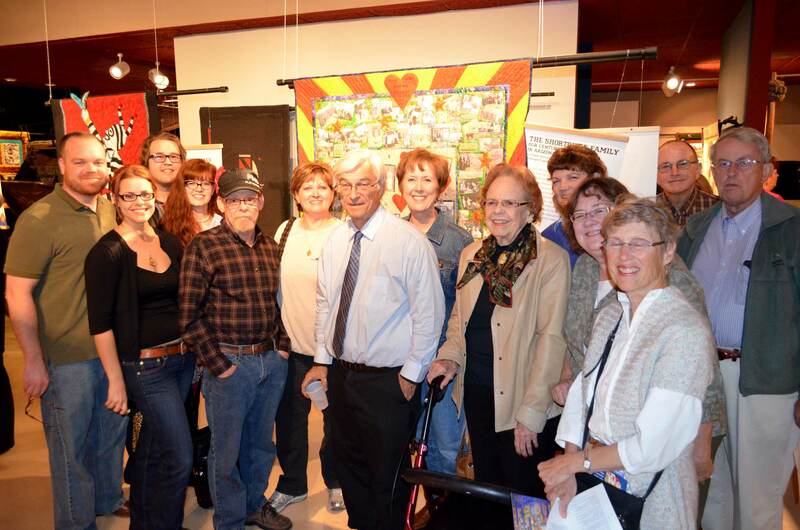 In addition the editors of the book from the show, which features photos of all 100 quilts and the legacies statements of the quilters who created them, were on hand to sign the book. A DVD documenting the creation of the show from the perspectives of its organizers, partners and a select group of the quilters is available for sale. 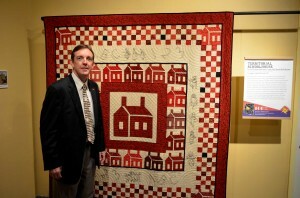 Ken Bennett with Prescott's Heritage Quilt And Study Group of the Sharlot Hall Museum's quilt, "Territorial Schoolhouse." The rules of the unjuried show were simple – the submitted quilts had to be recent, original designs relating somehow to the state of Arizona. They also had to follow certain size constraints. Within those simple rules came myriad visions of the state of Arizona. Family portraits and personal memories. Depictions of landscapes, flora and fauna, iconic images and historic architecture. Expressions of culture, nurturing and love, along with works of pure whimsy and abstract beauty. It’s a lot to take in, and thus a good thing that it will be on display for an entire year. 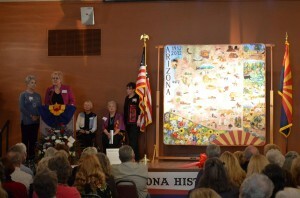 Glendale, Arizona quilter Diane McElmury with her quilt "A Tribute To Arizona's Amazing Women." Get by and see for yourself this extraordinary compendium of life in Arizona in its centennial year. 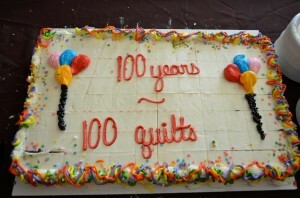 More from Daniel Buckley’s Quilt Project Blog. ~ by Daniel Buckley on February 19, 2012. The opening celebrations were so much fun. I learned more about the quilting community than I knew and truly enjoyed seeing the quilts on display. The history behind each was especially meaningful. The way they were incorporated into the museum exhibits was wonderful. Thank you for all your work. I know there are many who will visit the show over the next many months and learn to appreciate Arizona in a new way.